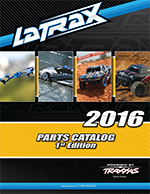 Request a FREE Traxxas Catalog By Mail! The full-color Traxxas Magazine showcases an assortment of our high-performance cars, trucks, boats, athletes, and Traxxas sponsored race series. Traxxas Magazine includes 100-pages with featured articles on going nitro or electric, new products, custom vehicle builds, and more. Plus it features all the info you need to pick the right vehicle for you. 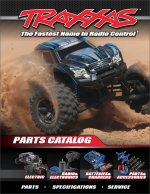 The Traxxas Parts Catalog PDF files can be viewed on a computer or stored on a tablet or smartphone for quick reference. The PDF files have bookmarks for each section, making it quick and easy to locate accessories, parts lists, and exploded views for each Traxxas model.